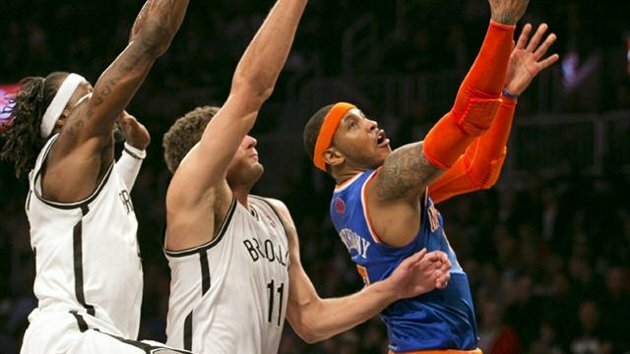 On Tuesday, the New York Knicks and Brooklyn Nets played their first game against each other at the Barclays center. Matt Domino talks about the game and what it had to do with Thanksgiving. I’ve written about Brooklyn before, but I’m going to write about it again. So, please bear with me. Depending on how things go, fifty years from now, when people talk about November 26, 2012, many will roll their eyes. People will roll their eyes because if history progresses and New York stays as relevant as it has been for the past 100-plus years, and if Brooklyn continues to gentrify and love itself as it has for the past ten years or so, then November 26, 2012, will represent an idyllic time when sports in New York was finally whole again for the first time since the Dodgers left town in 1957. It will be the night when the New York Knicks and the Brooklyn Nets were both NBA title hopefuls with promising seasons in front of them. The Knicks at 9-3 and the Nets at 8-4. The game had been postponed from November 1, 2012, due to Hurricane Sandy, but perhaps it was for the better—with the delay, each team had time to establish an identity, giving fans time to assess their realistic and unrealistic goals alike. Years from now, November 26, 2012, will be the first night that Marv Albert called a game in his home borough; the night that the Knicks and Nets played a tough, back-and-forth affair that saw more than a dozen lead changes and needed an overtime period to decide the outcome. It will be the night that Deron Williams had 16 points and 14 assists, while Brooke Lopez put in 22 and 11 and Jerry Stackhouse (Draft Class of 1995!) came off the bench to score 14 points; the night that Tyson Chandler had a career high 28 points from of a variety of ferocious slams as well as 10 rebounds and fine defense; the night Felton did his best impression of John Starks in Game 7 of the NBA Finals; the night Amar’e watched from a luxury box in Barclays, still unsure of his role upon return from injury; and the night that Carmelo poured in 35 and pulled down 13, but threw up bad shots when it mattered and wound up on the losing end once again. In other words, November 26, 2012 will be remembered as a night when basketball truly mattered all over New York (sorry Queens, Bronx and Staten Island, but I think one outer-borough can speak for them all, right?) and not just in Manhattan. When victory went to the traditionally working-class but now cool borough instead of to the inevitable, “better” one. It was a night of fantastic basketball that reverberated in the world’s greatest city; that connected to established history and planted the seeds for the history to come. It was an important night. I’ve written about Thanksgiving before, but I’m going to write about it again. So, please bear with me. This Thanksgiving, before the Knicks played the Nets in Brooklyn, I went home to Long Island as I always do. In America, the Wednesday night before Thanksgiving is the biggest drinking night of the year, and my town is no different. I got dropped off at my friend Erik’s house and we drank heavily-poured rum and cokes in his basement and talked about Hemingway and A Moveable Feast. My friend Dan came over and the three of us made jokes until suddenly, feeling drunk, I was being driven to a nearby bar where two of my old high school basketball teammates were playing music in a band. The bar was crowded inside and out. I went in to get some drinks and saw friends and people from high school, but since I live in Brooklyn, I come home enough so that I’ve passed the point of having to make a big deal about seeing someone or about being seen. Also, I’m 27 and it’s almost been ten years since my first Thanksgiving Break in college. At one point, I was smoking a cigarette with my sister by the fire-pit on the patio when a drunk guy I used to play basketball with walked up to us. He talked to my sister as if he’d recently hung out with her somewhere and then he turned to me. This wasn’t true. I had a slow, shifty crossover that allowed me to get into the lane from time to time to make some hard-earned, old-man lay-ups. But I was drunk and for a minute, I felt my heart race and I thought that perhaps I had been a better basketball player than I remembered. I laughed and shrugged and then he hugged me. None of this was true either. I hadn’t spoken to this guy since I was fifteen and he most certainly didn’t look up to me. However, as he pulled me in for another bro-hug, I thought, that maybe I had been "the best." And part me wanted my sister to see me the way this guy was seeing me through his drunken nostalgia and confusion. Then I remembered that I didn’t care and that my sister didn’t care either, so I wished the guy well and walked away. I got really drunk that night and hair-of-the-dogged my way through a very pleasant Thanksgiving meal the next day. On Thanksgiving night, I was back at my friend Erik’s. I was in his garage with my best friend, Chris, who was in from the remotes of northern Vermont. A bunch of us were there, actually. We were drinking and smoking and Chris’ brother, Adam, was playing guitar. We made up absurd songs. A breakup song where the singer admits to his girlfriend that “it’s been a couple years, but now I’m gay!” Chris made one up about “a little girl learnin’ how to ski”—it was not a cocaine reference. And I sang one “Highway 61” type number about every fast food mascot trying to take the Burger King’s fallen crown. It was funny, inspired and silly—it was old-friend, hometown fun. And we could all laugh and agree about that—something familiar but funny about the culture of the early 1980’s. Yes, the Islanders did actually win four Stanley Cups in a row. The weekend continued on drunkenly, and after tree chain-sawing and log organizing with my dad, smoking on the roof of a bar, listening to my friend tell me about being a doctor and how he has to explain to a family that one of their kids has died, and playing Harry Nilsson songs on an iPhone 3G’s terrible speakers, I was in the Corner bar on Sunday evening with my sister and three of my best friends eating wings, drinking beers and laughing. My friends tried to get me to miss my train, but luckily, my sister was there to talk sense and not beer. So, I put some songs in the jukebox and said goodbye to my friend Chris. “Rock the Kasbah” was playing. “This your last song?” I asked. I shook my head, we hugged like old mythical friends and then I was off rushing to the train. I just made it on and was still drunk. I didn’t have any cash, so the conductor gave me an invoice to mail my payment in. He shook his head solemnly and walked away. I sat in my seat while my friends texted me from the bar with their reactions to each song I had left for them to enjoy. My penance for having fun, for wading in the past was an $18.00 train fare and a ride back to Brooklyn alone. As I rode, I thought about all of my friends and the people I had known from Long Island. And, for the first time, I couldn’t remember what a lot of us were like in high school. I thought of the people with babies and engagement rings and the own lives they had that were completely foreign to me and different from the characters that had stayed embedded in my mind. “Good for them,” I muttered and looked at my shadowy reflection in the dark window. On November 26, 2012, while the Net and Knicks were tipping off in Brooklyn at the Barclays, I rode the F Train home to my apartment after another long, alienating day of work. I stood on the subway and thought about the recent New York Times article “How to Live Without Irony” by Christy Wampole where she talks about the insincere way we live in the "Age of the Hipster." Tired, I looked around the subway at everyone with their necks craned to their iPhones or iPads or Samsungs. They were either playing solitaire, reading a book, watching a show or movie, looking at e-mail or playing another game that wasn’t solitaire. Meanwhile, I was listening to music and thinking about how I just wanted to be alone in my apartment after a long day. I felt immeasurably sad and disheartened, but didn’t necessarily want to do anything about it. After I’d bought groceries and made dinner for the week, I settled in and watched the second half of the Knicks and Nets’ first matchup. It was a tough back-and-forth game and there were great performances and stars on each side. There were loveable role players, celebrities at courtside and rowdy, inspired fans. Because I like history, I started thinking about the legacies of both this year’s Knicks and Nets teams. What would they mean in twenty years? How would we remember them? Were the Nets developing an identity to fit the history of their borough? A working-class team with names like Williams, Johnson, Wallace and Blatche (JK! JK!). And most of all, were these two teams destined to meet in the Eastern Conference Semifinals as the #2 seed vs. #3 seed matchup? All of these scenarios, possible outcomes and potential futures swirled through my head. Then, I remembered that even though it was the first game in Brooklyn, and thus historic, it was still just an NBA game in November. Losing streaks happen and chemistry disappears. Anyone can get injured. A few hours after the Knicks-Nets game had ended, I was lying in bed trying to fall asleep. My apartment is quiet and peaceful, but sometimes the refrigerator makes a strange wheezing sound and sometimes you just can’t sleep. I was thinking about growing older, my life beginning to take shape with each passing month and year. And I wondered if perhaps my own life was actually happening without me even knowing it. I thought about all the people on the subway, the constantly hunched necks and how it all makes me sigh and resign myself to lean further against the corner of the rail and the sliding doors and listen to some obscure song. Not because I am better than anyone, but because, God, I just wish it were all something else; I wish I knew what it was all going to mean or become. Because I want to connect with everyone and understand them, but I’m just not that strong, my heart’s not as big or open as I want it to be and I just don’t have the time. Because, Christ, Hurricane Sandy. And I smiled in my bed. I remembered why it all made sense. Because no matter how bad I feel about myself and about humanity, about having white person problems, about being bad at love and about never truly being able to know even my own best friends and what they are going through, there is always a basketball game on and there will be people that care about it. There is always some kind of history waiting to happen or be written and made. The game matters even if it doesn’t matter.